Love both the dresses on you.. Interesting that Baby T's dress is so old and still holds good... There must be so many memories attached with that gown. Family treasure and history! I really wish we had summer here now..sigh. Have a great week ahead Mica!! haha I hardly get around to anything lately! Thanks for the idea, I think I could do all kinds of collection videos like that...I do have a LOT of dresses! Aww how sweet that he got to wear something that has been passed down generation to generation. Shame he couldn't use the one on his fathers side perhaps for future baby number 2?! Provided it can be repaired though :o( I love dresses belted, this has been something lacking of late. Not too many people pair dresses with belts anymore and it's a shame. Oh well, "fashion" can be fickle like that. haha one baby is enough right now thank you! Sadly, the dress couldn't be repaired, but it was good there was the one in my family to use instead. Wouldn't have been fun trying to pick which one to use I guess! Both look lovely on you! 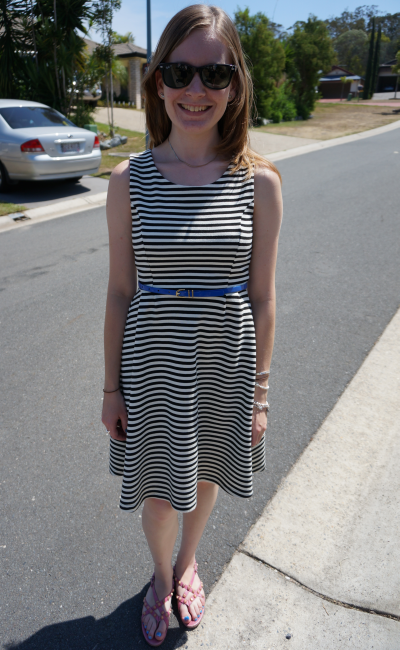 Pretty belt with the striped dress and oh how I love that second one. Looks gorgeous on you Mica. I love the color and print on you! The belted dresses are adorable.....and can I say that I loved your video! You are so stinking cute! Thanks for sharing your November purchases with us! Love hearing about the dedication. That is such a special time. Sounds like it was great! You wore the perfect thing. Aww, sounds like it was a lovely event, and I love your striped dress - were you and Baby T coordinating? I love that striped dress on you - the flared hem is awesome. I don't think the leopard dress is as bold as you think. It "reads" more of a solid pattern when I look at it. Thanks Sheila! That makes perfect sense! :) It does seem terribly bold in theory, but very wearable. I think you're right about how it comes across. Hi Mica, both dresses work, my favourite being the second one. both belted dresses are amazing!!!!!!!!! Oh, these are both such pretty summer dresses! you should definitely keep the red dress - looks wonderful on you. Congrats on the dedication service - so sweet.